Maybe not all wedding guests will know what to write in the book, and so with the book we are giving you this little hint as a gift. 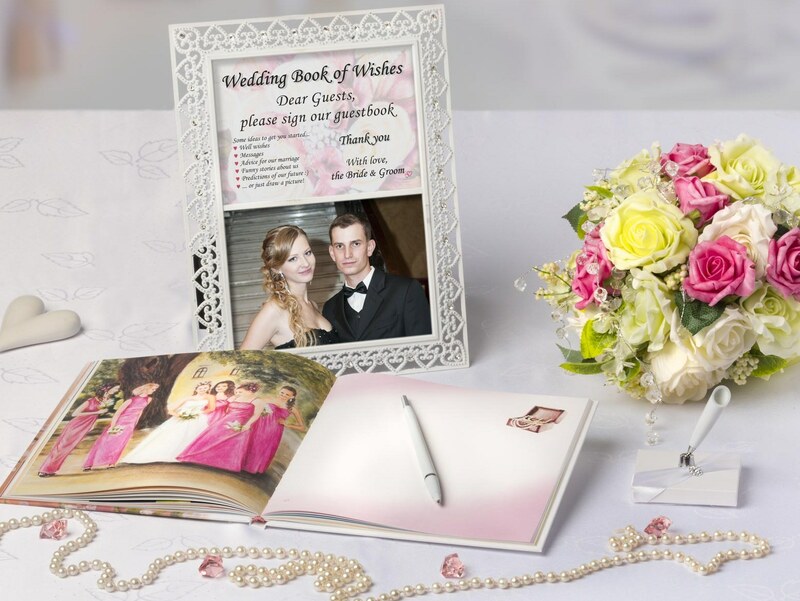 With each Wedding Book of Wishes we send a card that can be used directly at the wedding. The card addresses the wedding guests to write a message in the book and includes a few tips for them – what to write. Let us give you a bridal advice … 🙂 From our own experience we know that if the book is just put somewhere, some guests will walk around it the whole evening … but just a brief statement from the bride, the bridesmaid or the best man can make wonders. Tell your guests what the book is all about! Tell them that for you, the newlyweds, the book is very important and that any oughts, wishes or messages from your loved ones and all those invited to your wedding will make the book a jewel of inestimable value for you … and suddenly there won’t be a soul at the wedding that wouldn’t want to write a line or draw a picture in it… It’s worth it!